Lotusland is prized for its unique blend of the rare and exotic, and for the fact that its enigmatic and equally exotic creator, Madame Ganna Walska ensured its safekeeping for generations to enjoy. At first blush, the lady and her legacy are incongruous. Madame Ganna Walska- a name she adopted early on- was married, divorced or widowed six times in 39 years. A would-be diva with mixed success in the operatic world, the exotic and charismatic Polish-born woman called two continents home, acquiring properties on both sides of the Atlantic. She lived large, as it were, no stranger to the night life and glitterati of New York and Paris. All the while, though, she was searching for the "Truth," for her life's mission. She didn't know at the time that she married (and four years later divorced) him, but her last husband, self proclaimed Lama and Tibetan enthusiast Theos Bernard, introduced her to what would become Walska's passion and an enduring tribute to her colorful and creative life- Lotusland. The 37-acre estate became, from the time she bought it in 1941 until her death in 1984, her spiritual refuge, her challenge, her pride and her joy. The result, now under the watchful care and management of the Hanna Walska Lotusland Foundation, is an unparalleled botanical treasure, fulfilling Walska's wish as stated in her will "to develop Lotusland to it's maximum capacity into the most outstanding center of horticultural significance and of educational use." Considering that she had no horticultural knowledge, Walska's sense of drama and design as well as her creative boldness earned her the respect well-known landscape architect Lockwood de Forest as well as Ralph Stevens, then Santa Barbara's Superintendent of Parks who said, "She has an artist's feeling, using plants for stage settings." 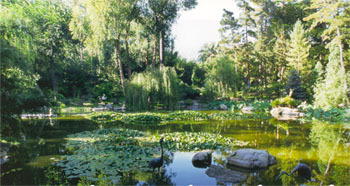 Just as there are stories within stories about Walska's life and the emergence of Lotusland into the spectacular site it is today, there are gardens within gardens at the Montecito showplace each path and plant offering a different, and many times entirely new, perspective on what can be done with nature's offerings, from the simple to the sublime. Themed gardens include: topiary, bromeliad, succulent, cycad, epiphyllum, cactus, fern, euphorbia, aloe, Japanese, Australian, water and a blue garden. And just as she was careful who toured the gardens and when during her lifetime, so too is the Foundation, which Walska established in her will "to preserve and enhance the spectacular collection of exotic plants to foster appreciation of the importance of plants and the need for their conservation." Docent-guided tours of this 37-acre botanical wonder are available Wednesday through Saturday at 10:00 AM and 1:30 PM from mid-February to mid-November. Advance reservations are required and may be made by calling 805-969-9990.